'It's Just A Mess.' New Orleans Residents Clean Up After Tornadoes : The Two-Way Tornadoes injured dozens of people as they moved through southeastern Louisiana on Tuesday. In New Orleans East, the National Guard was helping clear streets of debris and downed electrical wires. An aerial image shows the destruction in a neighborhood in eastern New Orleans after a tornado touched down there Tuesday. Louisiana's governor has declared a state of emergency. It was a familiar scene for many in New Orleans East, part of the city's Ninth Ward. "As helicopters hovered overhead and emergency response vehicles streamed into neighborhoods, it reminded them of [Hurricane] Katrina," reported Tegan Wendland of member station WWNO in New Orleans. "The area was hit hard by that storm, and now many families will have to rebuild again." "This house looks like it belongs in a Third World country somewhere. If you was to walk through and walk around, you would think a bomb went off," Terry Eubanks told Wendland, standing outside her apartment. Eubanks was at the nail salon when the storm hit. Her apartment was completely destroyed. 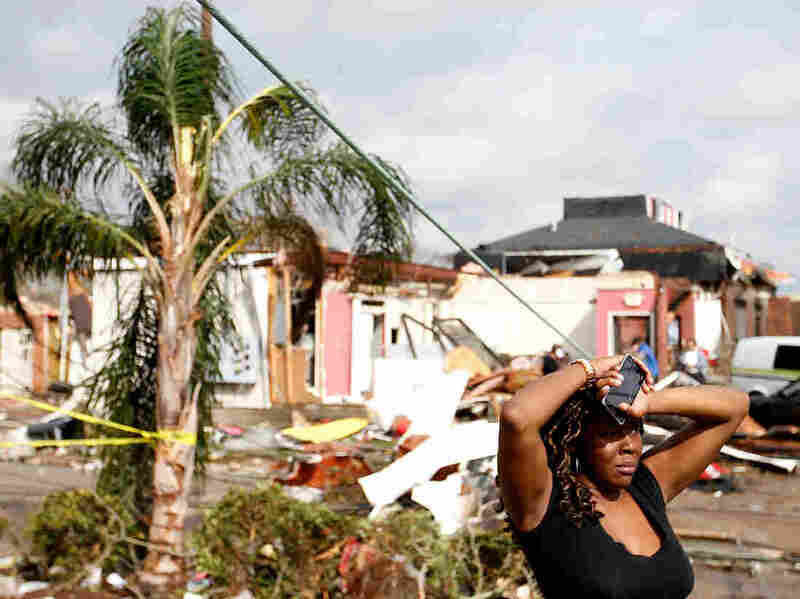 Officials said at least seven tornadoes touched down in the state on Tuesday, the biggest of which hit New Orleans East. The Times-Picayune newspaper created this map. New Orleans Mayor Mitch Landrieu said Tuesday that more than two dozen people had been injured in the city, with additional injuries reported in other parts of southeastern Louisiana. Louisiana Gov. John Bel Edwards declared a state of emergency on Tuesday. After an aerial tour over the affected area, he told reporters he was "even more impressed that so few people were injured and there was no loss of life." The National Guard is on the ground in the eastern part of New Orleans, helping clear roads of debris, prevent looting and protect returning residents from downed power lines, Maj. Gen. Glenn Curtis told reporters. Emergency responders were going house to house on some streets, checking for people who need help and marking homes with spray-painted x's and o's to show they had been searched. Chef Menture Avenue in New Orleans was littered with debris after severe storms on Tuesday. Cathy McGraw's home was badly damaged, she told the Times-Picayune. She spent Tuesday night in a Red Cross shelter at a local recreation center and said she planned to return there on Wednesday night. "Ain't got nowhere else to go," McGraw told the newspaper. Speaking to WWNO, Adriann Mitchell described the damage to her elderly parents' home. "The ceiling is caved in. The front window is out. And there's just water all over," she said. "It's just a mess." Landrieu said at a news conference Tuesday that the affected area encompassed about 5,000 properties, and that the city's emergency workers would transition from rescue to recovery operations going into Wednesday. "There are a lot of families that lost everything," he said. As helicopters moved overhead on Tuesday, resident John Spears told the Times-Picayune he was not impressed with the city's immediate response. "The city is a day late and a dollar short," he told the newspaper. "They should have people out here picking up debris right now." In addition to the tornado that damaged New Orleans, tornadoes also touched down in Livingston Parish, near Baton Rouge, on the north shore of Lake Pontchartrain, and near four other southeastern Louisiana communities. 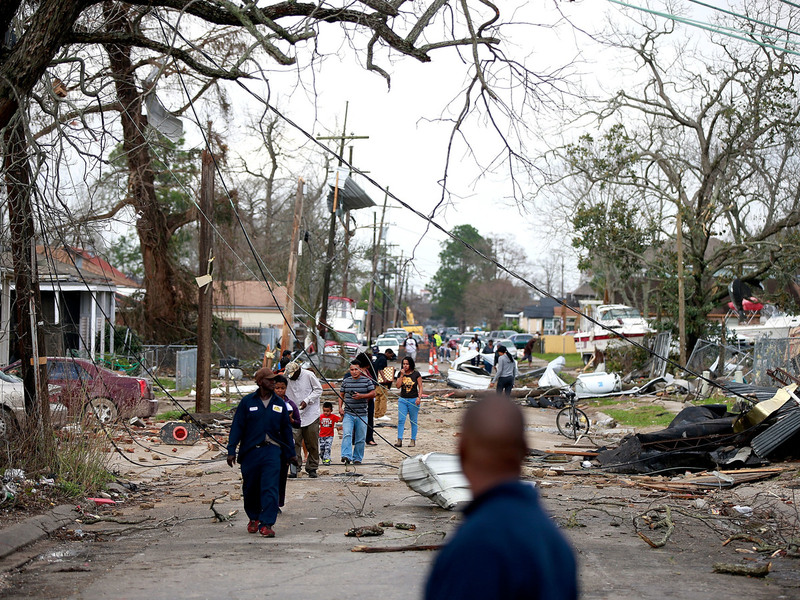 A neighborhood in the eastern part of New Orleans where a tornado touched down on Tuesday. 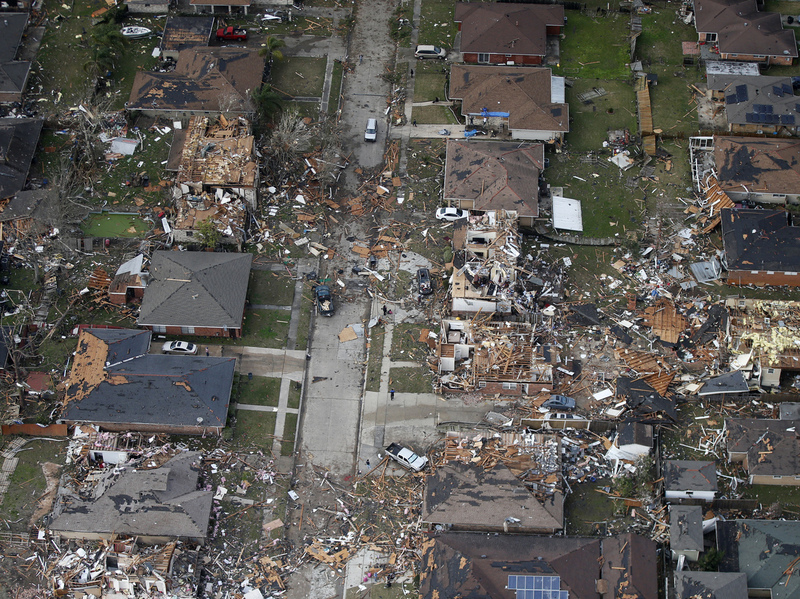 Tornadoes destroyed homes and injured dozens of people in the city. National Weather Service forecaster Mike Efferson told WWNO that big storms are common in the South this time of year. "It's not extremely unusual," he explained. "The unusualness is just the strength of the tornadoes. We usually don't get a lot of very strong tornadoes, but it looks like this one produced a lot of damage over a large area."